Be amazed at what you can achieve! 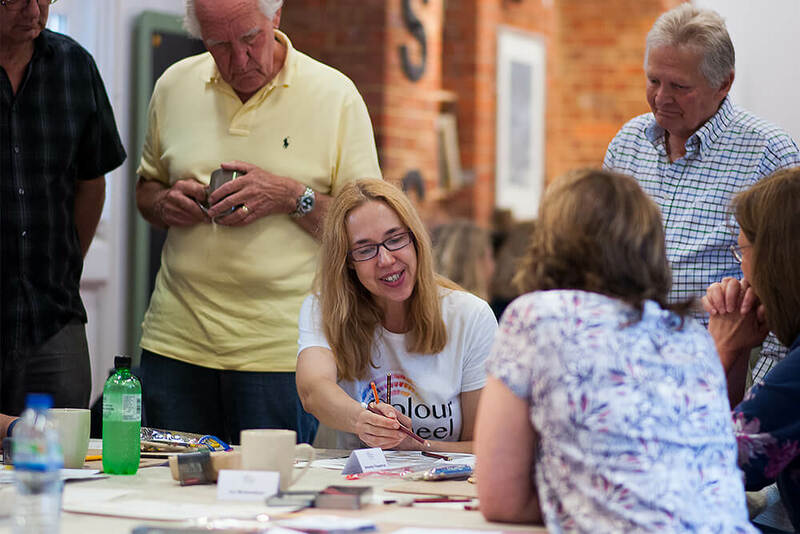 The ColourWheel Art Classes team are inspired by the desire to offer accessible, fun and creative art classes especially for people who think that they can’t draw or paint. All course materials are provided all you have to bring along is yourself. ColourWheel art classes for adults are part-time and have been designed for beginners and improvers. Drawing inspiration from nature and the rich colour wheel of life we will teach you the techniques you need to produce beautiful works of art. If you think you can’t draw you‘re wrong, you just need to be shown how. Giving you the right tools and skills you will be on your way to producing work you never thought you could. Over the 14 weeks you will be instructed how to use different paint materials to the best effect. Sketching and working with different mediums depending on the projects you are working on. You will be guided gently and taught by our wonderful and encouraging tutors. You will explore your creativity and produce paintings and drawings you will be proud to show others. The ColourWheel Art courses are a fun and friendly place to learn and make new friends. Held in lovely venues that will inspire you, we will help you to see the world in a new and exciting way. Our courses are flexible and allow improvers or those who have some art skills under their belts to build on what they already know and move forward to the next steps in their creative journey. Our course tutors are experienced working artists and teachers. 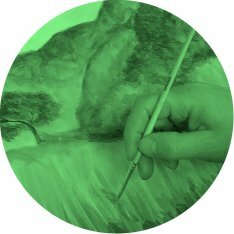 A Course Co-ordinator will attend each lesson assisting the tutor allowing each tutor to concentrate solely on what they do best, teaching you how to draw and paint. Thinking of joining a class? Speak to a Course Co-ordinator or book online today! The ColourWheel classes have been a revelation. Having all the materials provided is such a bonus; getting the opportunity to work in a variety of mediums and being taught how to use them properly. Encouragement and enthusiasm in bucket loads! Thoroughly recommend them to anyone wanting to find their artistic side. Wendy and I thoroughly enjoyed our art classes with Antoinette and Vivienne effortlessly providing us with all we needed and Antoinette’s skilled gentle guidance in all the beautiful work we created. From being a complete novice I loved using all the varied mediums provided by ColourWheel and I was surprised and delighted with the beautiful pictures I created under the gentle guidance of a superb teacher, Antoinette. Thank you both again. It was a lovely experience. Tuesday night art classes are the highlight of my week. Jane, our art teacher, has a passion for teaching, sharing and encouraging artists. Getting my hands dirty with charcoal, graphite and watercolor pencils is good for my soul. Can’t wait for next week, Asia’s smile, and our next colorful project. I know that the ColourWheel model clearly works and really facilitates the drawing-out of latent talent & skills abilities in a very creative and satisfying way which is both impressive and highly therapeutic from my own personal experience over two cycles of the ColourWheel courses. I, my family and friends are amazed and delighted by what I have learned to create in a relatively short time across so many mediums thanks to Nina’s guidance & tuition supported by Steve’s organisation of the courses. I have absolutely loved my course, it’s my time to do something that I enjoy, just for ME! I’ve learnt so much in such a short time. The course more than exceeded my expectations, it’s a great social occasion as well as being a learning environment in which we thrive at what we do. The venue is excellent with great views, our fantastic teacher and host work so well as a team. Thank you, Erica and Rene. I’ve just loved the whole thing! I have met so many lovely people and loved being somewhere where I can just learn and improve at my own speed. I have recommended ColourWheel classes to many of my friends. I have booked my place on the next course. I like the fact that I’m trying new things and this is something I’ve always wanted to try. I also enjoy the various mediums and techniques and Jane is great! Only wish we had more time in each class. It goes by so quickly. Hopefully this will inspire and motivate me to develop my own style and form. Asia is so energetic and sweet! I used to love art when I was at school, that was some 35 years ago, but I never knew I had any talent. Discovering the Colour Wheel with Chris and Heidi was like a middle age awakening to me. I loved it so much. Great ‘banter’ with the other students as we stepped each week through learning steps towards composing our pieces of art. At the end of the first 14 weeks, I could not wait to come back and redo it. A little hesitant as to whether we would be just repeating the same thing, I have to give credit to Chris and his teaching abilities as he brilliantly approached the building steps from a different angle and each week I definitely learnt something new. I now feel confident in having a go with a variety of mediums knowing some of the things that can be achieved, and I now very rarely throw something out. It’s a brilliant course. A complete beginner and I really didn’t think I would end the term with proper paintings! Absolutely thrilled with my new found skill. Nina has great patience! I have been sketching and painting on an irregular basis for about five years but had failed to progress from a basic level & was about to give up. A flyer came through the door and I noticed that the course provided all the materials & would teach many different mediums. I decided to give it a try and glad I did, the lessons are informative, we use different mediums & learn different techniques (Acrylic to Watercolour Paints, charcoal, inks, pastels to name just a few). Most of all it’s fun being with a group of likeminded people who help each other. There is a chance to socialise during coffee breaks, last year there was a private exhibition of our work held at Braywick Nature Centre in the evening. We also enjoyed a lovely a Christmas lunch as a group at Gogos at Windsor Marina. In fact, the only thing wrong with the course is that the 3 hours seem to pass too quickly! I regained my enthusiasm for art, and enjoyed it so much that I have now enrolled for my 5th term. I just wanted to say massive thank you again for the most brilliant art course!! I enjoyed every minute and thought everything about it was outstanding – the teaching, the hosting, the venue and organisation. I was looking to build my confidence again in drawing and painting and it is such a gift to have achieved that thanks to your classes. Thank you, you guys are amazing! Not having touched anything artistic since my early teens, I was very anxious to begin studying art in my retirement! I need not have been concerned. The ColourWheel course has been carefully planned to enable me to gradually build up my knowledge and experience with each week’s activity introducing something new but further developing what we have already learned. The tutor is warm and encouraging, the atmosphere safe and friendly and I have been delighted with how I have progressed. I look forward to it enthusiastically as a highlight of my week. I can’t wait to see where the journey will take me next! Having not picked up a pencil/paintbrush for over 25 years, ColourWheel gave me the opportunity to learn new skills and techniques in a relaxing and fun environment with like minded people who don’t take themselves (or their creations) too seriously. I have come away with some pieces that I am thrilled with and will be framing these as I reminder of what can be achieved at any age! I have enjoyed the lessons enormously under yours and Antoinette’s kind and inspirational guidance. Just wanted to say a big thank you for the fantastic art classes – I have learnt so much and lovely to start up new friendships. Thank you so much for sending some of the beautiful art that my colleagues have done, including your ‘morning’ session classes. Absolutely AMAZING!! They, and with Antoinette and your support, must feel so very proud, of what they have all achieved! ColourWheel has certainly continued to make my journey into this wonderful world of Art, magical!!! If you, like me, have experience with your art but it was a long time ago – in my case 17 years – your confidence might require a boost! You won’t regret it. The teaching is sensitive, very sound and very encouraging. No time is wasted, the subjects covered are extremely wide ranging and every opportunity is given to explore all media. I have thoroughly enjoyed and benefited from the course and will be returning to build on the experience. Everyone is very welcoming and friendly and we learn from each other. A great way to spend 3 hours! Well, I left class feeling a little sad today… as it was the last of a brilliant course. I just wanted to say thank you to you and Erica again for the most lovely time. I not only learned lots but so enjoyed the camaraderie within such a great like-minded group of people. Credit to you both for your amazing organisation skills, patience, and most of all brilliant sense of humour! All the very best and see you next year. I started my first term of the ColourWheel art class in Totton at the level of a very eager beginner, in love with watercolour which was the only medium I used and immensely satisfied with myself whenever I was able to produce work that resembled somehow the original subject. The classes turned out to be much better than I expected and simultaneously strengthened my confidence in my own abilities while expanding immensely my artistic knowledge. With every week, exploring a new exciting topic of art theory and a new medium, in a relaxed atmosphere that made me feel at ease and able to get the best out of my creativity, I learned almost without noticing about the basics of drawing, colour theory and mixing, composition and use of various media. I can now confidently (and smugly) use terms like shade, tint and tone, the rule of thirds and know that there are seven head heights inside the height of an ideal body (who would have guessed that)! I can visualise the colour wheel in my head and I have done a beautiful poppy painting using just the three primary colours and white :)). I have fallen in love with pastels and acrylics and use them confidently alongside watercolour in projects outside the class. I have also learned how to combine the various media and textures in surprising ways I wouldn’t have thought off working on my own. Where I also think that this course is special is that each week the students are given freedom in choosing the subject they want to paint and then guided according to their level of ability and encouraged to discover and develop their inner artistic skills and inclinations. The result is truly inspirational and I am sure that each one of us has been surprised at the creative resources that we all carry within. The student exhibition organised at the end of each term is witness of this, as each one of us will find amongst the work we have created throughout the course at least one piece that we are happy to show to our friends and families. Add to all these working in a spacious room surrounded by art and craft work of other groups, our lovely assistant Heidi welcoming you with a beaming smile and a box of yummy sweets every week, a relaxed environment where friendship springs effortlessly and banter and laughter fly freely between working tables and you will understand why the rhythm of my week goes now from Wednesday to Wednesday rather than one week-end to another. I am now in my third term of the course and still bewitched by it! So far no two classes addressing the same topic have been the same and therefore they have kept the freshness and excitement of the first day. I don’t think I would ever tire of attending the course and if I will ever stop it will be just because I need time to order in my head the vast amount of knowledge that I have acquired and to try to put it to practice. But then after I while I would want to get back. So for anyone out there tempted to try the ColourWheel art classes in Romsey and Totton – they are incredibly fun and exciting but irremediably addictive. Having wanted to do something with drawing or painting for years, I saw ColourWheel’s course as a great way to try different mediums and get some tuition in a very convenient location close to home in Wendover. Having found my first course fascinating and hugely encouraging, I have signed up for a second and am already gaining more confidence. Such an accepting environment! Jane gives positive suggestions and encouragement. It has been a great learning experience. I look forward to the next session. What a lovely art experience. I enjoyed a few hours a week of creativity in a tranquil environment with wonderful people. The art instruction was casual and allowed me to take risks with choices that resulted in a fun, rewarding experience. I currently attend ColourWheel Art classes on a Wednesday evening at Camberley Cricket Club. I have found the art classes very helpful and enjoyable. The art teacher is a very knowledgable and friendly person. The setting is great and the classroom is perfect! The class is made up of a mixture of men and ladies with varying experience (though mostly beginners, like me!) and all of them are very friendly. The course work is very interesting and we learn (try out as well) a number of different mediums, i.e. drawing with pens, pencils and charcoal, oil and soft pastels, watercolour and acrylic paint. We also get taught colour mixing, composition, colour theory/harmony and light logic. All in all, a wonderful experience. Held in lovely and inspiring venues our art classes focus on delivering high quality teaching and our course content will give you a solid base of techniques and skills in a variety of mediums. Our classes are a wonderful place to meet new people and have fun. 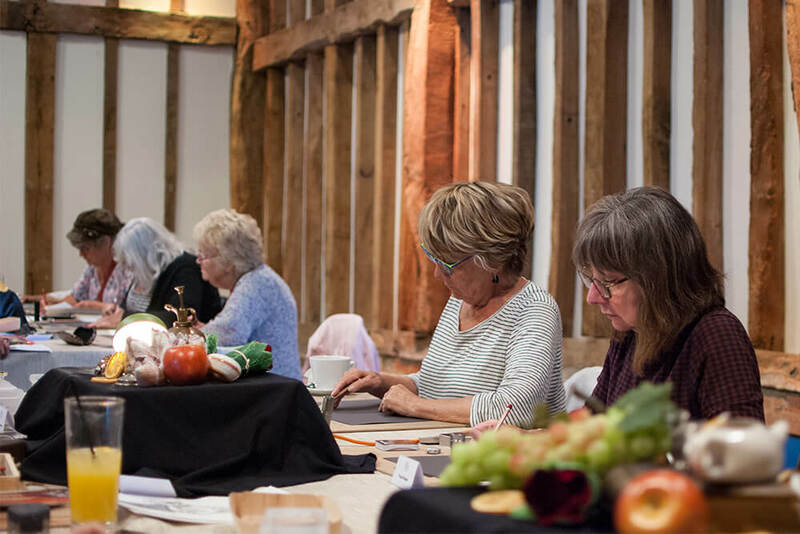 See our classes in action and hear from Rene, who runs the Windsor and Maidenhead courses, describe what you can expect from the classes. The course offers ways of developing a new perception of world as seen by an artist. Find inspiration to express each experience in a personal language and create images through colour and exciting materials. Throughout the 14 weeks, principles of drawing and painting are progressively practiced with techniques and subjects such as landscapes, still life, figure drawing and portrait. Be inspired by what is around you, our relaxing venues are the perfect place to express your creativity. Our classes use a wide variety of media, including pencil, charcoal, ink, pastels, watercolour and acrylic paints. Our classes allow you to develop your own style and we encourage you to develop your creativity. Our students are as varied as the art they produce but all have a love of art in common. Friendships are made and our students often meet up before or after class for lunch or coffee, sometimes planning painting trips to local beauty spots or visits to galleries. We always have an end-of-term party or event which is always welcomed and very well attended. You have a chance to look back on what you have achieved over the 14 weeks and see how much you have improved. We are happy to answer any questions you may have but if you would like to see what the classes are like for yourself we can arrange for you to visit your local class, meet the teacher and other students and even join in for a lesson. Call us on 01628 676979 to find out more or book your place.